(-wait for it-) If you haven’t heard of How I met your mother yet… you’re missing out. I’m not an addict of the series (as some of my friends) but I really enjoy watching it, it’s fun, a wide range of people can relate to the different characters and it even deals with more serious issues such as racism. But the main reason for a linguist to watch it is… the language, of course. Just take this scene – wouldn’t it be awesome if people came up with such an amazing wordplay in everyday life, rather than reading it off a script!? Jerry: So, Saturday night? Time to cut loose, right? Who wants to split a beer? Marshall: Um, those places shut down a long time ago. Marshall: Oh No shut down too. Lily: Where’s where Was was, isn’t it? Barney: No, Was wasn’t where Where was, Was was where Wrong was, right? Ted: Not OK, that place is lame. Robin: OK is Lame? I thought Lame was a gay bar… or is that wrong? Marshall: That’s Wrong. That’s not wrong. Robin: Oh, I like Focus! Let’s go there. Lily: I thought Focus was closed. Barney: No, Was was Closed. Once Was shut down, it re-opened as Closed. Marshall: So Closed is open. Robin: No, Closed is closed. 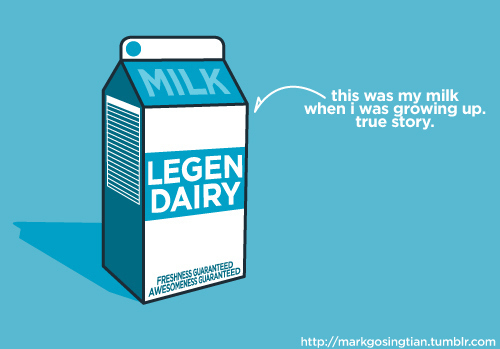 its gonna be legen…wait for it…and i hope you’re not lactose intolerant cause the next part is… dary! This entry was posted on 02/05/2012 by G in Academia, Linguistic Musings and tagged how I met your mother, legendary, quotes, tv.